And newspapers wonder why they don’t connect with younger readers. As we mentioned in the Weekend News Recap, the state’s two largest, esteemed and owned-by-out-of-state-interests newspapers – The Oklahoman and The Tulsa World – both endorsed Kevin Stitt to be the next Governor of Oklahoma on Sunday. Although the editorials use their own unique order of passive words, phrases and clichés to justify their expected endorsement of the GOP candidate for governor, the gist of each is about the same. In fact, the editorials are so similar you have to wonder why they didn’t just co-produce one general endorsement as part of their content-sharing agreement. Fallin has earned another four years in office. Mary Fallin is a genuine conservative who does a good job representing Oklahoma. She promised a business-friendly state, and she delivered one. She promised reform, and she delivered reform. She promised prosperity, and prosperity we have. We hope and challenge Fallin to look at the areas we have identified, and we look forward to seeing it happen in the next four years. Oops! My bad. I accidentally copied and linked to The Oklahoman and Tulsa World’s regrettable 2014 endorsements of Mary Fallin. It’s kind of funny to read them in hindsight and see how wrong they were. Anyway, now that we put the endorsements of our state’s two largest partisan newspapers in proper perspective, let’s see how they spun their endorsement of Stitt. That’s irritating. Instead of being honest with their few remaining subscribers and writing something like “Just like most people, we’re tribal, indoctrinated partisans who are going to endorse the candidate from our political party of choice regardless of their background, qualifications or experience,” they try to make it sound like Kevin Stitt – an anti-vaxxer who didn’t’ support the teacher pay raise plan and follows the same political ideology as Mary Fallin – is some sort of visionary change agent because he’s made money in the mortgage industry. Kevin Stitt may be a new record, but as that clip shows, he’s playing the same old GOP song that’s made our state a national laughing-stock over the last four to six years. If you’re dumb enough to fall for his “outsider businessman” shtick and let it mask over the direct parallels between him, Mary Fallin and other members of the GOP establishment that led this state into the shithole, then you should probably write for one of Oklahoma’s failing newspaper’s Editorial Boards. Just like any GOP gubernatorial nominee, they’ll welcome you with open arms. Next post Sonic limeade coupon lands local man in jail! made all that money on mortgages, still has a $6 haircut. And six dollars obviously doesn’t include an eyebrow trim. I swear blind if the Dems could have rolled out anyone with half a grain of charisma this douche could have been beaten. I mean, I literally cringe when I see Edmondson’s TV ads and I’m a dyed-in-blue Dem. He comes across like a soggy dishcloth. Stitt couldn’t be bothered to vote until he was on the ballot because he’s “not a politician”. Well, neither am I, but I’ve voted in every election since I was 18. I don’t think this state can handle failing Fallin 2.0, but the sheeple will vote red, against their self-interests, again. What Dem would want the job? We were lucky that Drew was senile enough to think it’s 1984 and Gene Stipe and the Little Dixie Mafia are still running the Senate. Succeeding Fallin is like taking over the helm of the U.S.S Oklahoma at 7:00AM on the 7th of December, 1941. Let her slip quietly beneath the waves a victim of the cupidity of her current compliment of officers. Then we can begin the salvage operations, honor those lost and resurrect her after the court martial hearings. Funny how both the Tulsa World and Oklahoman endorsed Mayor Mick in the primary, and now endorse Stitt. But as you pointed out they both endorsed Fallin, so just the same old lie just with a new candidate. Stitt stopped being an “outsider” when he got the nomination. Why do newspapers feel it is their mission to endorse candidates? TV stations stay quiet, I guess to pretend to be impartial and get ads from all the candidates. Do politicians not advertise in the newspaper, or do only the ones who get the endorsements advertise? This looks like the playbook from the Oklahoman’s “readers choice awards.” The local businesses win awards by buying big ads in the special readers poll section. The readers buy newspapers to vote for the suckers who bought the ads to get “nominated” for the award. Sounds like the only winner is the newspaper. That’s why I don’t buy the paper. May it die a quick death!! You think Edmondson can capture the younger audience? Stitt is young enough to be his grandson. I admire Stitt, I think he will merge some new ideas with some conservative ideology. Complete audit will turn up enough waste to fund the new teacher wages. That is what he was pushing for in the first place. FUNDED teacher raises. Yes, the supposedly unlimited government waste that is behind all of our problems and only if we could eliminate that, we would all be peachy and have no budget holes. I’m not saying we don’t have waste, we do. We’re bad at managing money. But it’s delusional to think that we can keep cutting revenue streams in this state and not wind up with budget holes. It happens every single time we do it, we cut taxes, wind up with short falls, and have to wind up increasing licensing fees or cigarette taxes or sales taxes to make up the difference. The Edmondson ad comparing Stitt’s rhetoric to Fallin is just what people need to hear. How can we expect anything different if he’s singing exactly the same tune while backed by the same old corporate sponsors as Fallin? Whenever I start to think that the Tulsa World editorial staff actually thinks things through before expressing their opinion, they do something like endorsing Bull Stitt – or Markwayne Mullin. The World called Bull Stitt the more likely “agent of change”… because he’s so much like Mary Fallin, who was also endorsed by the World? To me, a vote for Bull is a vote for more of the same. Bull Stitt over National Democrat Bull Schit any day of the year. Edmondson was a big Obama and Clinton supporter – that’ll lose any election in Oklahoma and rightfully so! Correct, unfortunately most Oklahomans have a conniption every time the name “Clinton” is mentioned, no matter how irrelevant it is. I’ve yet to see a Kevin Stitt ad that mentions a single idea of his, instead just name dropping Clinton and Obama. So we’ll probably have four more years of “Thank God for Mississippi” while Oklahomans continue to wonder why we keep getting worse and worse in everything. Sadly, we’re still Oklahoma; still ruled by the masses of baby boomers who are going increasingly senile and voting more conservative every year, not giving thought to the world they leave behind. They will check the Republican box on the ballot because there is literally a stigma against being a democrat in this state. 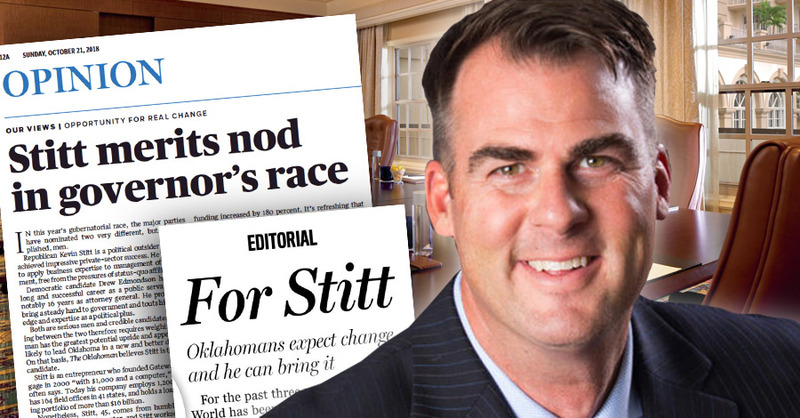 Of course the papers are going to endorse Stitt, regardless of his lack of qualifications for our top job – being seen as friendly toward a democrat in Oklahoma wins you less than a third of the population and more than a few sneers from little old ladies as they pass by. I think Edmonson is a geriatric fool and Stitt won’t be any better than Fallin. Their stances on the big subjects have me ranking them at the same level. That said, if one of them will grow a pair of balls and decide to support recreational legalization of marijuana and release those in jail for it, I might just check their box in November. Opinions are like another part of the human anatomy, everybody has one. Shut up and vote. SmokieTheOkie You should vote for Libertarian Chris Powell for Governor. Powell is in favor of legalizing Marijuana and releasing all those in jail for non violent drug offences. This November vote Libertarian. Did you vote for Ralph Nader in 2000? For Jill Stein in 2016? Nice! I guess you showed those losers in the two major parties, didn’t you? And made yourself feel righteous in the process. How’s that working out? Graychin I voted for Gary Johnson for President in 2016 and Harry Browne in 2000. I vote Libertarian because I agree with Libertarian public policy and disagree with the public policy of both the Democratic and Republican parties. If someone is bullied into voting for a candidate they disagree with because other people say your preferred candidate can’t win then you have wasted your vote. Voting 3rd party is never a wasted vote. To me it makes no difference if a Democrat or Republican wins because both of those parties are equally bad. They are bad for different reasons, but neither is better than the other. I will continue to vote Libertarian. I don’t feel righteous, but I do feel good after casting my ballot. You ask how is it working out for me? It’s working out great! There is a Libertarian State Senator in Nebraska. Three Libertarian State Legislators in New Hampshire. I forget which one, but there is a Libertarian State wide office holder in New Mexico. And the polls show that Gary Johnson is running ahead of his Democratic opponent for US Senate in New Mexico. Oklahoma has only recognized the Libertarian party since 2016 so while we are not on the same level as Nebraska, New Hampshire, or New Mexico at this time, we will be. Bull Stitt’s big thing is making government spending transparent by putting it online. Guess what? It’s already there and has been for YEARS. It’s called open books. He also states he’ll audit each state agency. Again, that happens every year. I haven’t heard a single new idea out of this pile of Stitt yet.